The San Fernando valley is a frontier for taco establishments. From the carnitas michoacan huts to the trucks with blinking taco signs there is a abundance of taco destinations to choose from. But I didn't come for the carnitas michoacan this day nor was I on a hunt for a hidden taco truck in any back alley. I was on the hunt for a bull in the region. Rincon Taurino to be specific. 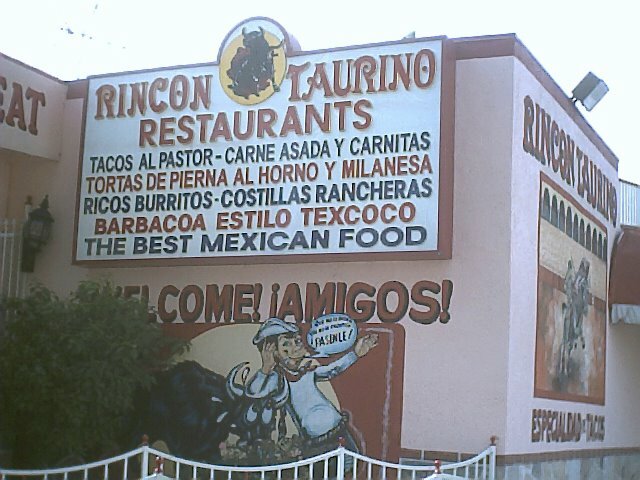 As you can tell from the name and the photos Rincon Taurino is another taqueria with a bullfighting theme. I was eager to test my theory that any taqueria with a bulls head mounted on the wall must have delicious tacos so I headed out to Panorama City. The girl at the counter didn't speak english so I pretended I didn't speak english either and ordered in spanish. Dos tacos de asada y un de pastor para aqui. After a brief staring contest with the bull head (the bull won) my tacos were ready. "hey gringo...you better like my tacos"
Looking for a place to sit I was surprised by how expansive the seating area was. Rows of booths with vinyl seats, stools propped up against wooden counters and several tables outside. They are open til 3am on the weekends so all this seating probably comes in handy for the late night club crowd looking for that taco fix. I bit into the al pastor first. Tender seasoned pork with a crunchy glaze. In a word, fantastic. Some of the best al pastor I've had. The salsa roja was a perfect compliment to this salty pork that i'm already starting to crave again. The asada was equally impressive with heavily seasoned braised beef on top of tortillas seared with the taste of the grill. The salsa roja at Rincon Taurino has a real distinctive flavor and alot of kick that goes well with the fine cuts of savory beef. 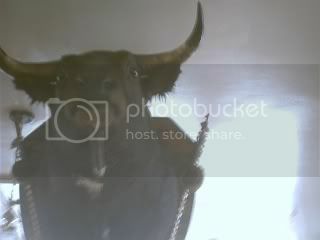 So once again I've looked into the eye of the bull and have yet to be disapointed. The theory of the bull may have some truth to it. One of these days I want to dress up as a matador and walk into one of these places.I would walk in and claim to be a real matador and offer to sign autographs only after I was brought a plate full of tacos and a rice horchata. On second thought I'll just stick to eating tacos. Rincon Taurino is my ALL TIME FAVORITE TACO PLACE ON EARTH. I used to eat there literally every single day for months and months, their red salsa has some kind of addictive quality I think. Of course, after a while I was quite an oddity, la guera que come asada, and I got to know a few of the nice folks who work there, and they confided to me that their asada is so good because they marinate in overnight in cerveza! I love your blog. The taco is the perfect food. and you're so right about that red salsa. It's better than king tacos. This is my neighborhood taqueria. My husband and I visit there as "default mode" whenever the cupboard is bare or I either don't feel like cooking or it's too hot to cook. You missed a few of the best dishes on the menu, though. They make very tender, tasty and LEAN Pierna de Cerdo (leg of pork) tortas and burritos. No they don't make tacos de Pierna, alas. But get yourself a Torta de Pierna con Salsa Rojo and you are in hog heaven. They make great Carnitas too. The Carnitas is rendered nearly devoid of fat by their cooking, and has an appealing crunchy chewy texture. Mmmmm. Another thing worth sampling at Rincon is the Burrito Vegetariano. Rice, beans, plus Queso Fresco, avocado, tomatoes, lettuce, onions and cilantro. Hit it with their awesome salsa verde with its Serrano chile and garlic bite, and it's good eatin'. Lastly every Saturday and Sunday they pit-barbecue lamb (Barbacoa) and chickens. The chicken is wonderful and should be on the menu every day. $6.50 gets you a half chicken and enough sides for two people to eat like it was Friday night with an observant Jewish household, if that observant Jewish household was in Mexico. Their Pollo en Barbacoa is second only to Zankou. It's totally *different* than Zankou (you will want to remove the skin rather than consume every crispy bit) but it's in the same league for sheer gustatory pleasure. I've never been brave enough to try the Barbacoa but it brings in a huge crowd. Whole roasted lambs get cut up, bones and all, and served in a consomme. They serve it with minced "pancita" (it doesn't look like bacon to me, it looks like some sort of blood pudding) and with plates of rice, beans and guacamole. 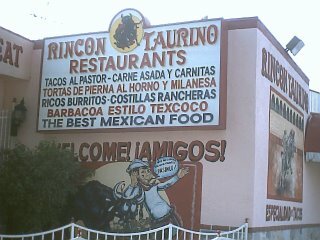 Rincon Taurino makes me proud to live in Panorama City. !Que viva! this place is the bomb try the tostadas they are to die for!! This place is amazing. Too bad it's so far north, so I can't go there all that often. This place is GREAT. Only problem prices went up and serving size went down. But still tastes great!!! 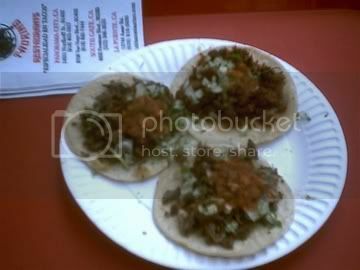 I grew up eating these tacos but when I moved out of Panorama I had to let go of my taco haven. Now there's this place on Balboa and Devonshire behind the Denny's that I always go to. Their sauce is amazing and their tacos are just the perfect amount of greasy. I would recommend anyone go there because they are soo delicious. Im not sure what the name of the place is though because it's been changed more than once. Its No Ricon Taurino but its still pretty amazing. It's sad. They charge you 50 cents for every single condiment. I love this place. I've been going there since as long as I can remember. I would go with my dad when he picked us up on the weekends. Those are good memories, sundays after church we'd go and get some tacos. My favorite is carne asada tacos and burritos. Sometimes I'll get al pastor when I want something different. My friend said the veggie burrito was the best he ever had, but I've never tried it myself. Judging just on taste and quality I give them 4.5/5. I rarely ever get a fatty piece in my tacos, and that's a deal breaker for me. I hate when you order tacos and you have to pick out half the "meat" before you can even eat. But over time the tacos and burritos have gotten smaller and the prices got bigger. I keep going back so I guess the prices aren't too crazy yet. I discovered Taurino through your website a couple years back and it did not disappoint. They were by far the best tacos in the valley. But lately, the Carne Asada tacos have been really bad. Hopefully, it's a fluke and not indicative of a real change for the worse. I love the salsa so much that I started to experiment with different ingredients to try to make it. I went the "Hey what's in the salsa" route every time I ate there, but to no avail. It's a highly guarded secret. They once told me that the owner makes it and distributes it to all the locations. From what I gather they use chipotle, probably habanero, lot's of black pepper, and some kind of vinegar and salt. I don't have it down yet, but very close. I don't plan to open my own restaurant I just enjoy it. If you have a different ingredient, hit me up!